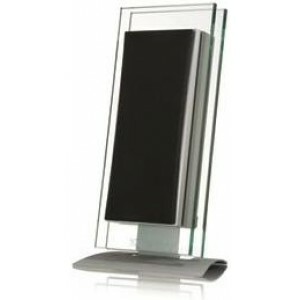 Waterfall Audio Elora satellite speaker is beautifully sculptured with a thick double sheet of glass and solid aluminium structure. Elora is closer to art than to hi-fi, yet sound amazing and are some of the most stylish speakers we've seen. Elora can be bought in pairs and used as stereo speakers either on a solid surface or wall mounted with the included wall bracket. Match these with a standard two channel hi-fi amplifier, minature system from Teac, or with a stylish iPod system from the likes of Fatman. One thing is guaranteed - they'll look stunning!